December seems to rush by faster and faster each year. This year I wanted to make the most of those magical moments as we count down the days until Christmas. One way we’ve done that is by setting aside our usual curriculum and giving everything a holiday twist. Our morning reading time has been devoted to our Jesse tree ornaments. We’ve also been having lots of fun with Christmas STEM activities like this fun Elf on a Shelf Zipline. After all, any time of year is perfect for fun STEM activities with the kids! At our house it all started when the kids found the elf on top of the refrigerator. I challenged them to come up with a way for our elf to get down safely. 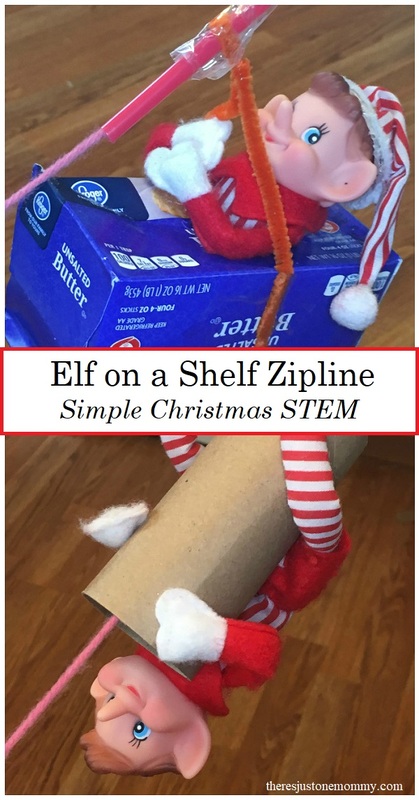 This elf on a shelf STEM activity is perfect if your elf finds himself in a similar situation. There is a wide variety of materials you could use for this STEM activity, many can be found in the recyclables. Additional materials that may inspire your child: egg cartons, craft sticks, and plastic cups. One of the first steps in building the zipline is determining how long the yarn must be to go from the starting point to your elf’s destination. This takes a little measuring, and later on, after some trial and error, it may change a bit. Your child can use tape to secure the yarn in place to make it easier for adjusting later on. Then it’s time to get building. Threading the yarn through a piece of plastic drinking straw is one possible idea that will allow the completed zipline to travel from start to finish. 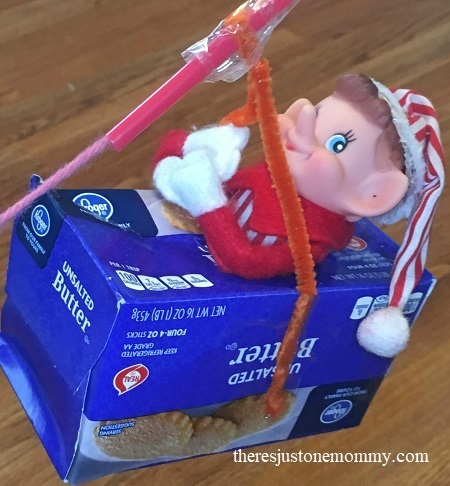 Pipe cleaners can be used to secure a small box to the straw, cutting a hole in the box for the elf to ride in it. Or your child might find a way to attach the box directly to the straw. Or they might even skip using a box at all. Once your child has it built, it’s time to put it to the test. 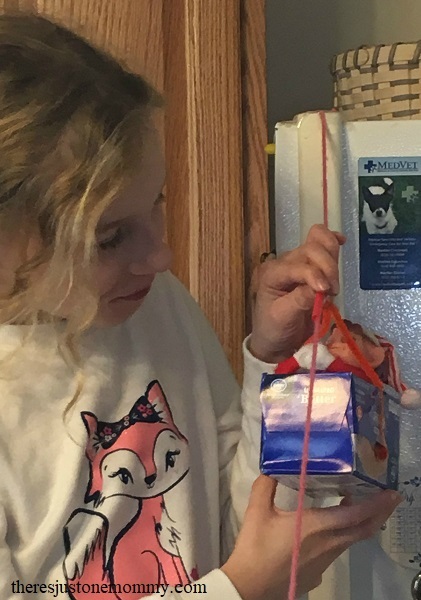 If you have a traditional elf that can’t be touched, your child can test the zipline by using a toy of similar size — a small stuffed animal or doll. We do our elf differently, and the kids are free to touch him, so he was available to test out our zipline. Your child might discover that the yarn needs to be adjusted at this point. This is a perfect opportunity to learn how tension and the angle of the yarn affects the elf’s travel. If the yarn isn’t tight enough, or if the angle isn’t steep enough, the elf may get stuck. Your child might also discover their original idea doesn’t work. It’s all part of the learning experience. At first my son tried to hang the elf on the yarn and let him just slide down on his own. But then he discovered that idea wouldn’t work (too much friction). 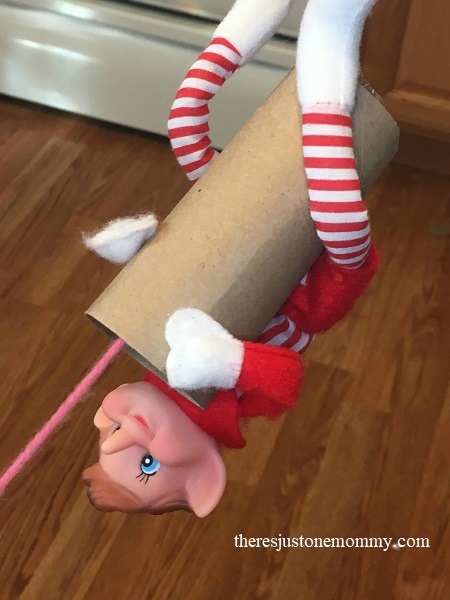 Instead of a plastic straw, he opted to thread a cardboard tube onto the yarn and let the elf hang onto the tube instead. Our elf was soon safely zipping down from the refrigerator. We had lots of fun watching our elf safely glide from the top of the refrigerator to a kitchen chair leg, where the end of the zipline was tied. I think it may be one of our favorite Christmas STEM activities so far. If you’ve got a traditional elf on a shelf, he or she might even use the zipline at night if you leave it up once your child goes to sleep. Get more hands-on ideas like this, and a free printable Christmas scavenger hunt, by subscribing to our newsletter.